There is a luxury accomodation and a party entrance to Music Club has been already put in the price. Fields: SPA Plzeň, Líně, Mýto or Lhota. Music Club: Free Entrance to well-known Music Club in Pilsen. On Saturday you play at the unique SPA field. Pilsen welcomes you with all the trimmings! Stylish accommodation in hotel Victoria in the centre of the city waits for you (in case of full capacity, we accommodate you in the same quality hotel). 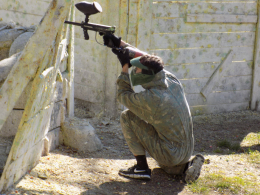 There is a parking place where you can park your car and few minutes from the hotel is our unique paintball field which is in the area of the former town wellness centre. The useful and necessary information you will get in the SPA building (our paintball field) where you will also get the tickets for your big night. No limitation shooting, you play at full blast and there are 3 adrenaline hours for you. After briefing, safety speech and the paintball rules speech all 'paintballing' begin. 3 hours of AYCS which means unlimited ammo is a quite fun. If it's not enough, you may buy another additional hour. If you like the field you are welcome to be there on Sunday as well! In the evening go and drink beer and visit well-known Music Club. When it gets dark go to the city, eat in the favourite restaurant called Corso Srdcovka where the fair beer is drawn and the Czech cuisine is cooked. That is not the end of the evening of course. There is a ticket in your pocket to the Music Club in Pilsen. Look forward to the best DJs in Pilsen and the party ends with the sunlight. Recover your strengths and on Sunday go back to the real battle! On Sunday you have a breakfast. 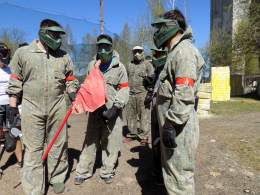 There is another batch of paintball. You can play at near fields as Líně, Mýto or Kamenice. There you will make good use of what you've experienced the day before. It's just up to you if you want to have a rest, cover and hide against the enemy or if you go back to the SPA field.